Source: Physical copy received from Nick! "I'm so not enough. I can't be. I smile, and I act happy, and I pretend. I'm the queen of bright and shiny things, eternally looking for the positive and seeking a silver lining in the dark." This book originally caught my attention due to the adorable cover. I liked the post-it notes and the images of a happy couple, so I definitely wanted to pick it up. Nick was gracious enough to send her copy to me since she knew I was interested in it! I'm really glad she did because I enjoyed Sage's story, as heartbreaking as it could be at times. I really liked Sage's character. She has a good heart and always tries to see the best in people and situations. Her classmates have dubbed her the 'Post-It Princess' because she is always leaving positive post-it notes on other kids lockers when she sees they need some cheering up. I thought that was too kind for words. We all know random acts of kindness can go a LONG way. The scene where Sage herself realizes this at the end of the book had me in tears. It showed her that there are good people out there and that what she has done MATTERED. As you can tell from the quote above, there's more to Sage than meets the eye, that's for sure. She has been through quite a lot in her young life and she has some fears of her own that are hiding just beneath the surface. I loved Shane. He is the new guy and Sage feels a kinship to him, having been the new kid once before herself. She takes it upon herself to befriend him and I loved watching them develop a relationship. It's just so sweet and he really needed someone like Sage. He just wants to keep his head down, stay out of trouble, and get through high school. Sage changes that for him and it really warmed my heart to see her care for him. His current living/family situation is pretty heartbreaking. I loved Sage so much for everything she did for him. These two made me swoon and I loved that Aguirre handles their relationship so realistically. "I wish I could have all of your firsts, because you're getting all of mine." This book isn't just a romance between Shane and Sage. There are so many other factors at play. Sage has never had that many friends and after a fallout with her best friend Ryan, she ends up expanding her friend circle and I liked seeing that. Her Aunt Gabby is also an important part of the story and I liked their relationship as well. Gabby is a good parental figure for Sage and she isn't just an afterthought in the story, but she plays an actual role in Sage's life. This book addresses all kinds of social issues that teens face these days and I was glad for that. We see bullying, pressure to fit in, and strained friendships, just to name a few and while this wasn't an overly action packed book, we do get a good depiction of an every day teen's life. There were a few parts that felt a bit slow to me, where there wasn't really much moving the plot along, but overall I liked the book for what it was and I can't wait to see what Aguirre does next! I'm so really happy to see that you loved this one so much! 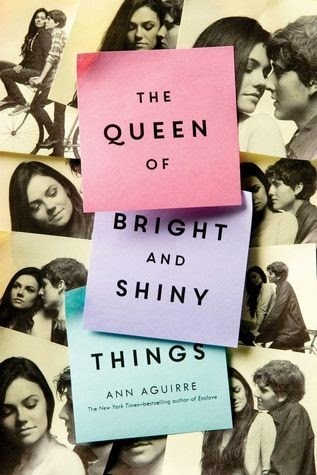 I'm a huge Ann Aguirre fan so I was pretty sure I'd like this one too and given all that worked for you, I'm pretty sure it'll work for me too! Oh, I really want to read this one! I really enjoyed Aguirre's NA series, so I'm pretty sure I would love this one too! I really loved this book! I think though what sold me most is that there is a lot of Sage in Teen Teresa so I connected to her immediately. I also LOVED Shane and I loved how realistic the relationship between them was. This book was so sweet and so heartbreaking and I just adored it. Great review! I loved this book so much! Such a great read for teens and adults. Sage was the best and I really wish I knew someone like her when I was young or even now! Lol. Lovely review, Jess! I loved this book too. Sage is such a great character - so vulnerable yet so strong too. The idea for the post-it notes was so cool, too! Of course, I fell in love with Shane... that boy was so dang sweet!